Enterprise Architecture (EA) covers different disciplines such as Business Process Management (BPM), Enterprise Application Management (EAM), Application Portfolio Management (APM) and Service-oriented Architecture (SoA). In short, EA not only describes the interactions between business and the supporting IT, EA also means the management and governance of the change of an organization’s business and IT strategies. A leading EA methodology is the TOGAF® framework developed by The Open Group. As TOGAF basically is a framework of methods, The Open Group has also developed the ArchiMate® modeling language to graphically describe business, application and IT architectures by means of TOGAF. Also SAP® is committed to TOGAF. Back in 2007 at the Orlando SAPPHIRE event SAP came up with the first version of their SAP Enterprise Architecture Framework based on TOGAF. 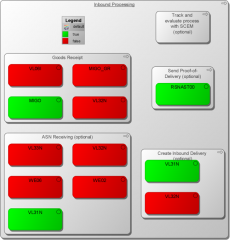 The goal of this approach is to support the adoption of SoA concepts for SAP landscapes. TransWare AG (as an SAP Services Partner) and BiZZdesign (a leading EA tool vendor and ArchiMate driver) have developed an SAP-centric adaption of EA driven by TOGAF’s ArchiMate to document, analyze and plan the change of SAP landscapes. One of the main objectives of SoA is to enable business agility supported by a more flexible, coupled IT service infrastructure. But not only SoA that is in focus: also basic SAP operations, upgrade or project challenges are addressed by this solution. It directly loads architecture information from SAP landscapes into BiZZdesign’s ArchiMate-based Enterprise Studio for subsequent review and action. A very important first review step is to gain a good understanding of the currently deployed processes, applications and IT components in the SAP and even non-SAP landscape. Here the ArchiMate meta-model offers a good and easy to understand structure to fit in all available information objects. The joint TransWare and BiZZdesign team have developed a coherent mapping of SAP objects into the namespace and meta-model of ArchiMate. For the technical layer the SAP system landscape directory (SLD) is analyzed and related information is extracted that describes the technical components of the SAP landscape such as host systems, servers or databases. If available, this information can be extended with data from a configuration management database (CMDB). For the application layer many bits of information are taken into account: SAP systems, modules and applications, transactions and reports are described, RFC calls made from 3rd-party applications or portal applications, the customizing of transactions and reports (so-called Z-transactions), SAP technical components, various interfaces such as IDOCS, BAPI, web services via RFC and SOAP, customized and used document types, database meta-data with custom extensions, used master data and organizational data, optionally HR data and more than 50 types of modifications such as custom changes to all kind of SAP standard objects. 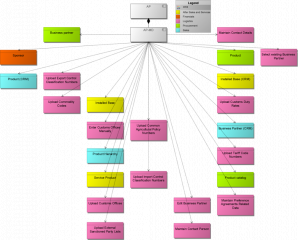 The business layer describes the business process architecture by capability maps and business services. For this end the process repository managed with SAP® Solution Manager fits ideally. If a Solution Manager blueprint project or solution directory is available, it can be loaded into the business layer. Otherwise this information can be generated from SAP reference models coming with SAP Solution Manager. Such reference models are called Business Process Repository (BPR). When using BPR content, the SAP standard can be automatically pre-scoped by the current usage of SAP and then fine-tuned in SAP Solution Manager.